Photos by Russell Ord, clip by Andre Rerekura. 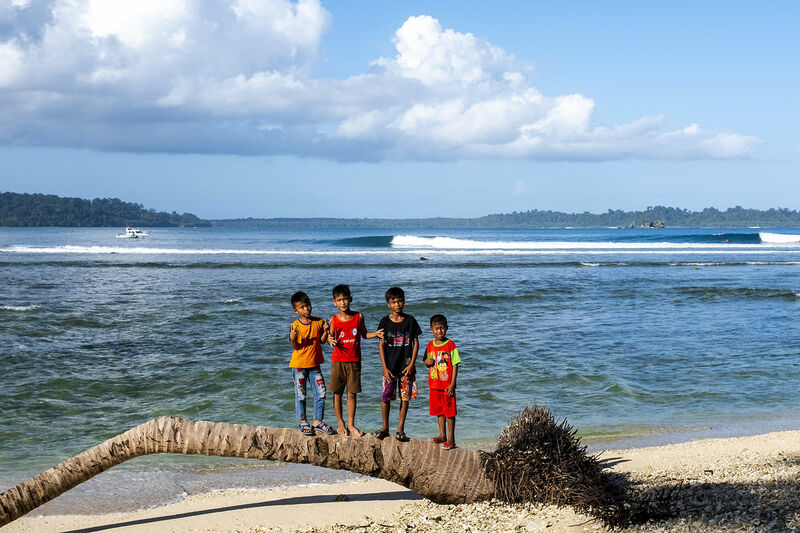 Kai Otton and Tom Carroll recently undertook a trip to the newly minted Monkeys Resort South Telo. For Tom, the trip marked the welcome end of a fairly testing period of recovery from a succession of surgeries. “I’d just come off a knee replacement, which had been planned really well. The rehab had all gone smoothly, then I was snowboarding with my daughter late last year – the knee was holding up well – when I caught a toe edge on some sticky snow and rolled onto my right shoulder. It was a five centimetre full thickness tear of my rotator cuff – absolutely toasted. It was a full half year before hitting the ocean. “The shoulder was a totally different experience to the knee. Where there was all the time in the world to prepare and plan around the knee, the shoulder was out of the blue, and the rehab was a really tricky and long six months in comparison. “And so coming out the other side of that, I was super happy to get the opportunity to get to the Telos – I hadn’t been there since 2003 on a trip with Martin Daly – and to surf these really fun breaks with few others out was the perfect way back into surfing. The Telos is such a beautiful place to be. 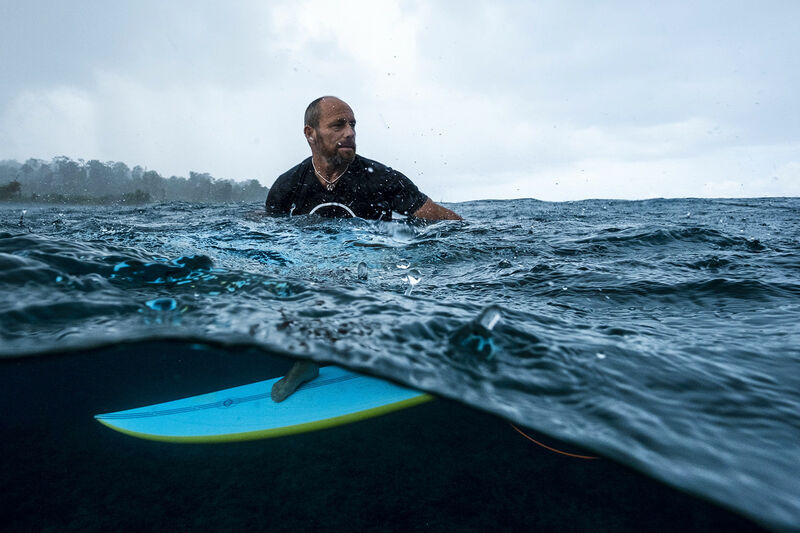 “I’ve always pushed myself hard in the water, but this trip, I was still coming into my knee and shoulder and had to be mindful the whole time about not going beyond my capabilities, so I had to surf at 70 percent. “My younger self would have really struggled with not going flat out, but I was able to enjoy going at 70 percent, thanks largely to the Vedic Meditation I’ve been practicing for the last three years. (20 minutes, twice a day) It’s allowed me to care coherently for myself. It’s a relief to finally be able to enjoy surfing within my limits, not pushing at the edge of them all the time. 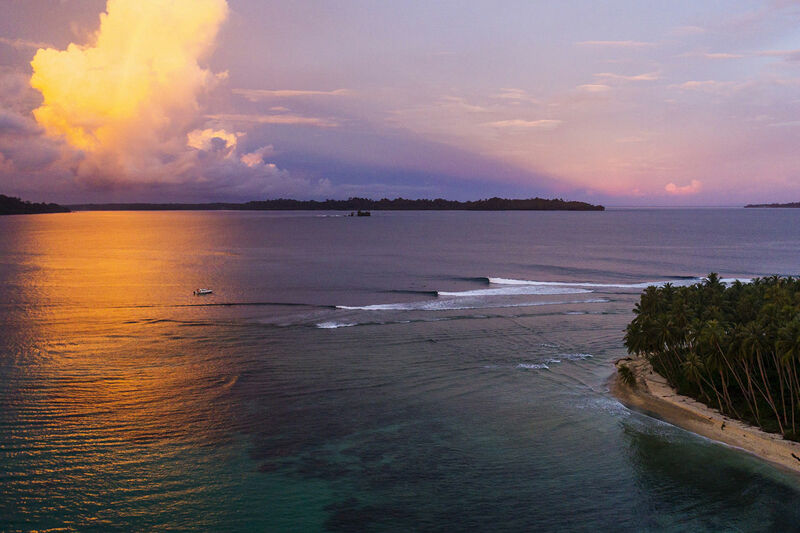 “The break out at Monkeys is a really fun, playful ride, but there’s all these other spots – around the corner and up the reef – that ramp up the scale, lots of options and you can push yourself. The south Telos is a smorgasbord really. I think the break ‘New Schools’ is the funnest right and my favourite. 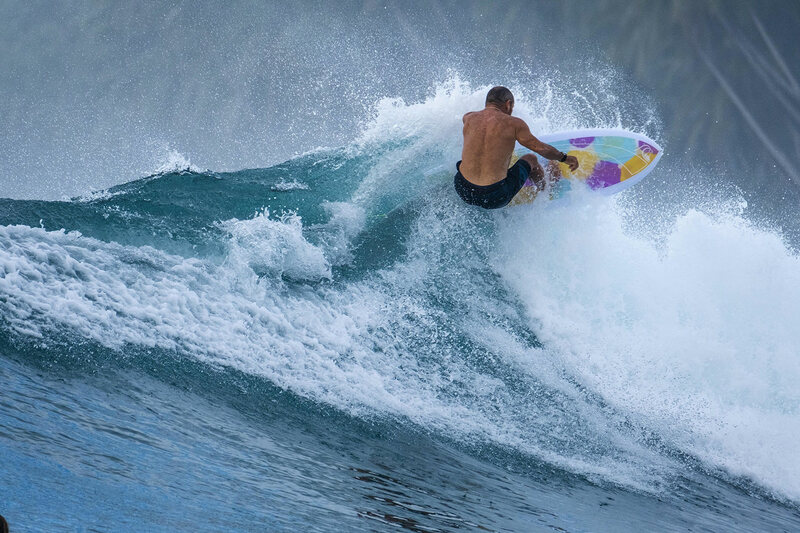 Like Tom, Kai had come off a fairly ordinary run injury wise – consecutive surgeries for hernia, knee, and surfer’s ear issues are enough to dampen anyone’s surf stoke, but when the invite came for the Monkeys trip, Kai jumped at it. “I’d never been to the Telos before and it’s always good to check a new place out. There’s a real range of waves in the area. Monkeys is super fun and perfect for intermediate skill levels and up. It’s a magnet too, there were waves at Monkeys pretty much the whole time we were there. The most consistent break in the area from what I saw. 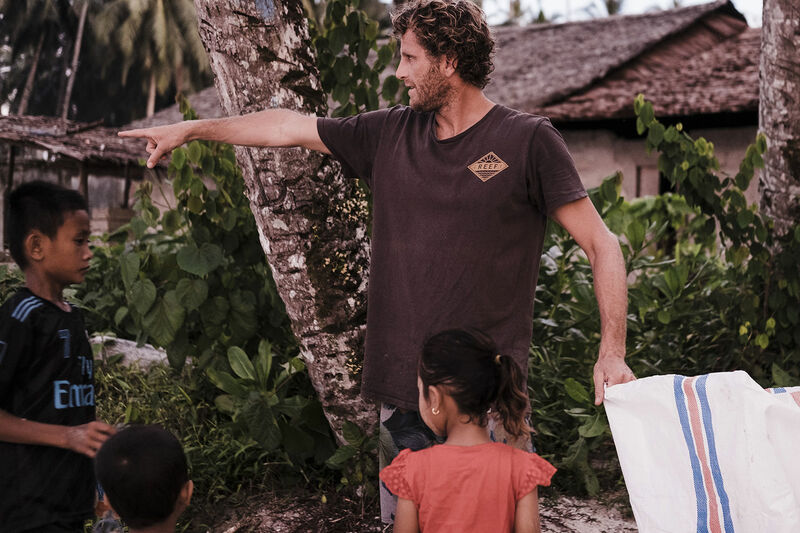 “We didn’t get a major swell while we were there so it’s hard to say for sure but overall it generally doesn’t feel as challenging as the Ments, but there’s heaps of options. Like on the day Monkeys was onshore we went across the bay and surfed an offshore left to ourselves. One left we surfed actually hadn’t been surfed before. “As far as the place goes, the resort’s primo. You’ve got these bungalows, palm trees, coming down to the sand. Can’t get better really. There’s a really nice vibe around the place. “It’s been a bit challenging for me since coming off tour and all my injuries. I’ve been surfing shorter, fishier boards than I used to, and not chasing crazy stuff. It’s still good, but it’s just been different. It was unreal surfing wth Tom, he was kind of cruising but he’s as much of a frother as I am, so we’re both grommets pretty much. Only just opened 2nd half of 2018 and its been brought by Pegasus Lodges already? True but just backing I think, the guy who created it is still in charge. 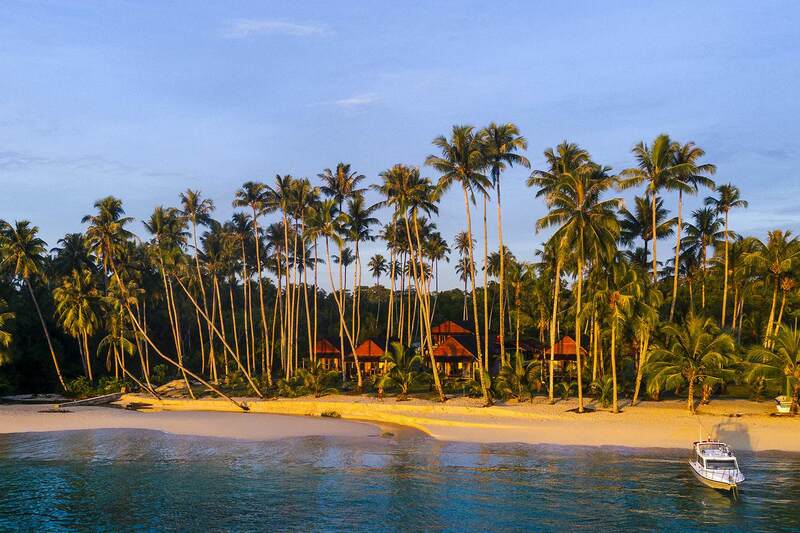 The guy who built the resort is now running all the Pegasus Indo resorts. I think they realised it would be better to have him with them than against them. It's a pretty special place. At least they generally have small groups, unlike RLZ. Indeed Carpetman, most probably helps keep their logistics costs down somewhat. They got 4 boats now. Each day 2 north, 2 south. Whats included and whats not included for my $577 per night / 9 day stay ?? A lot of hot air....read comment below. Does it come with a free bout of malaria? No malaria in the area. When i was there I didn't even see a mosquito. Went fully prepared with long sleeves and pants and sprays but was pleasantly surprised. I think I remember you Nem88. You're the professional free-surfing, semi-sponsored (by Nurophen) journeyman. 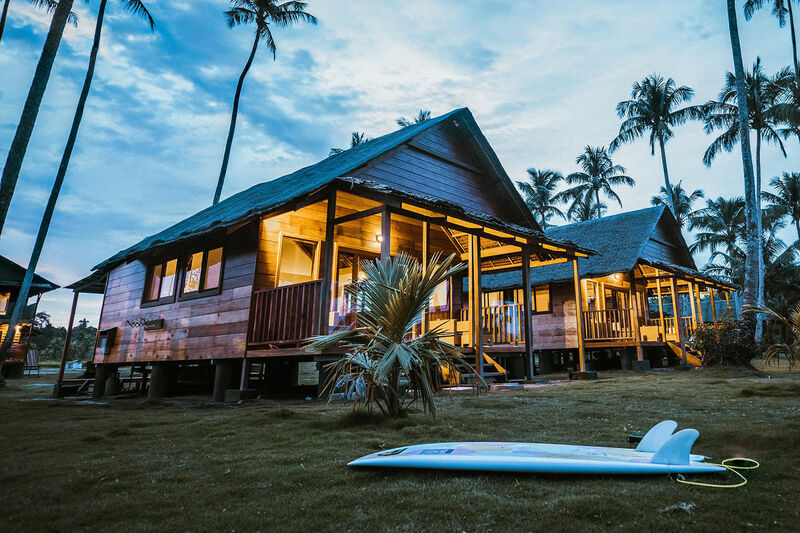 So there was once an Ozzie bloke, with decades of experience surfing and working in Indo who fell in love with the best and most consistent wave in the Telo's and decided to build a small resort right out front of it. I was lucky enough to stay there not long ago and it was magic. Monkeys is a little slice of paradise. Okay Mum, you can stop making aliases now. Have stayed at Monkeys and it's easily the best place in the area....if you want to surf. If you want to spend time on boats every day looking for surf or sitting around drinking, there are probably better places. "Good surfing is all about great stance. Tom Carroll has great stance." If you can tell me who said that and in what surf movie it was said, I will let you win the Bon Bon pull at Xmas dinner. 'Good surfing is all about great stance! '...Gidget's Dad? I'm just messin'... pretty sure it was June Dally Watkins? Sounds so 1950's housewife! I'm actually changing my guess to John Howard? The day I stepped off the rails was my first lesson on how to surf good. Nothing comes between me and my wave!